There are a few small niggles, but assuming that these can be addressed in an update, the eTron makes for a good and highly affordable source of Mellotron sounds. 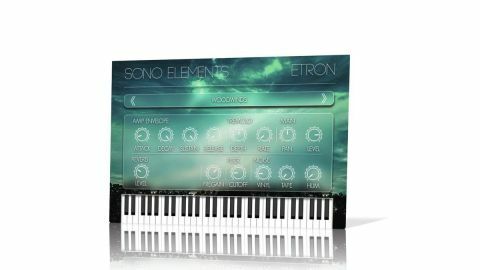 A virtual take on the Mellotron (the Birmingham- built tape-based ancestor of the sampler, made most famous by the flutes in The Beatles’ Strawberry Fields Forever), eTron packs 200MB of samples into Sono Elements’ proprietary sample playback engine. You get seven of the ’Tron’s best-known sounds - Cello, Strings, Choir (Women), Woodwinds, Brass, Flute and Choir (Men) - selected using previous/next buttons. The lack of a menu for instant selection is irritating. With the exception of Choir (Men), which loops endlessly when held, each sound extends for the full eight seconds, delivering the authentic release ‘drop’ of the real thing. We wonder if there’s an issue with Choir (Women), though, as it only lasts six seconds and cuts off very abruptly - clearly not how it should be. The looping thing is strange, too: we’re mystified as to why we can’t set all sounds to loop like Choir (Men) - and why Choir (Men) can’t be set to not loop, not that that matters. Anyhow, there’s an ADSR envelope onboard for shaping the amplitude profile within the eight seconds, while the misnamed Tremolo effect is actually an auto-panner, and not a particularly good one at that, thanks largely to its unsynced but nonetheless stepped Rate control. Further effects include a tastefully short reverb, a gentle low- pass filter, and three flavours of noise: Vinyl, Tape and Hum. Vinyl and Hum give you plenty of range, from very quiet through to excessively dominant, and are both thoroughly convincing, but Tape is far too loud even at its lowest setting - it needs recalibrating. There are a few small niggles in there, then, but assuming that these can be addressed in an update, the eTron makes for a good and highly affordable source of Mellotron sounds. The playback engine is decidedly basic, but then, that’s to be expected at this price, and the samples have been well captured.